It has been brought to my attention that certain areas of the trail and a few businesses have some beef with our people. We get smelly, we rip apart buffets, and we party like rock stars on our breaks from the trail. We can’t help these things. There is no way we can shower daily on the trail. After spending a week in the woods, I don’t even notice that my body is in desperate need of a shower. I just get used to it. Obviously, we’ll do some damage to an all you can eat buffet. Our bodies are starving for nutrition and you can only eat so much trail food before you’d give your left leg for pizza or some unidentified Chinese food. Alcohol becomes a comfort device for some. We use it to wind down at camp. 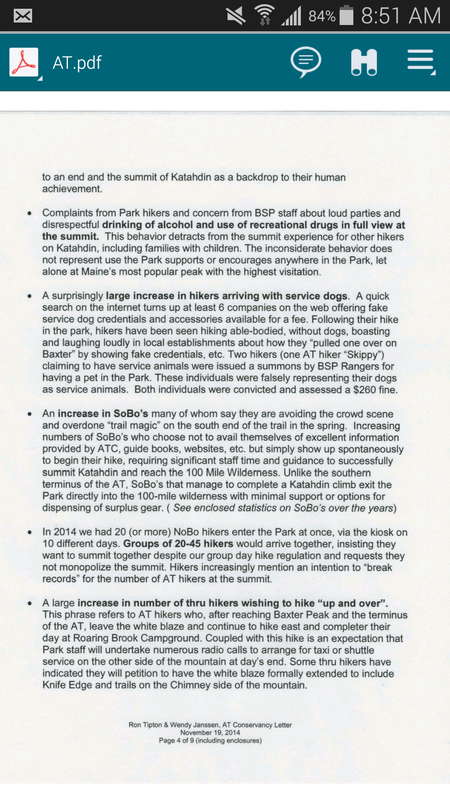 We use it to celebrate an accomplishment, especially when we finally see that beautiful sign on Mount Katahdin! This has formed a bit of a problem. Be prepared. Know your designated camp sites and respect others. The ATC recommends keeping large groups to a minimum. Yes, shelters are a first come, first serve process, but they recommend that larger groups step aside to let smaller groups occupy the shelters first. Keep maps and guides handy, and study them ahead of time. Everybody poops. It’s a fact of life. If we didn’t poop, we would die. Don’t forget to bury your poop. You can find a nice spot at least 200 feet from the trail, water sources, and campsites. Dig a hole at least 6 inches deep and 4 inches wide. You may bury the toilet paper with the poop, but baby wipes must be considered trash and packed out. Food is a big one. Try not to prepare more than you can eat at once. You’ll just have to pack the waste out. You can always make more food if you are still hungry. Consolidate your food in reusable zip locks so you have fewer wrappers to pack out. Strain the debris off of your dishes while washing them into a slump hole, and pack out the food particles. Do not burn your food waste. Fires! There is nothing better than a fire on a cold night or just to gather around for socially. Use designated fire pits, only. You may burn dead wood and leaves that you find laying around, but do not take wood off of live trees. Do not burn your trash. The fumes are awful and can attract unwanted critters. Be mindful of areas where fires are not allowed. Most guides will tell you this information. Remember to let the fire burn out completely before leaving the pit unattended, and always clean out the pit and scatter unused wood once you are finished. Wildlife! We love seeing beautiful animals along the trail, but they are not always are friends. Use bear canisters or hang your food in areas that require this action. Even if it is not required, but bears have been seen, do it. Do not bother animals. Do not get close to wildlife just to snap a picture. Partying! Be respectful of others. Children may be sharing your campsite. Hiking is a very family oriented hobby, and it needs to stay that way. I’m all about having a good time, but be careful. Drink responsibly. Inebriated hiking can be extremely dangerous. It takes just one drink to impair your judgement, and hand/eye coordination is the first thing to go. Pack out your trash! Know the rules! If camping is not allowed, don’t do it. If dogs are not allowed, don’t take them. If night hiking is not pernitted, don’t do it. There are signs everywhere, so read them. Rules are put into play for your safety…. and following the rules will save you a lot of money. Some hikers simply do not know these things. There is a plethora of information on the Appalachian Trail Conservancy’s website. You can also find all of the rules and regulations for certain areas in many guides, such as AWOL’s A.T. guide. We can’t help being smelly, but we can definitely help in keeping the trail clean and leaving no trace.